We're happy to announce that Wyng'd Lyon Creations will once again be vending at Gaslight Gathering this coming May. 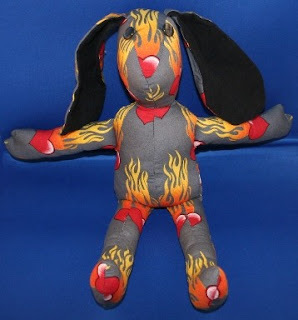 Congratulations to Shani who is the winner of our Flaming Heart Bunny Giveaway!!!! She was picked via the random number generator. 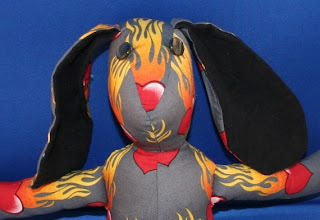 Shani, watch your inbox for an email to get your information so we can send out you bunny, which you said you would name Flaming Fire! Thank you all for your entries and comments! We'll be hosting another contest soon from a great artist and dear friend of mine. In addition to all the supplies that we've been listing on Etsy & Artfire, we're running a special on out bat pillows. Our first giveaway for 2012 from our own shop! Flaming Hearts Bunny is up for grabs! He's made of grey cotton fabric printed with red hearts with flames. The inside of the ears are black cotton flannel and he has button eyes. Fine print: This stuffed animal is not intended for young children as the buttons could present a choking hazard if they were pulled off and swallowed. Now onto the stuff you need to know..
To be entered in the giveaway, leave a comment on what you would name this little guy. Please note that your entry is null and void if I have no way to contact you. If you have your profile set to private or if there is no email or blog connected to your post, you must leave an email address with your entries. 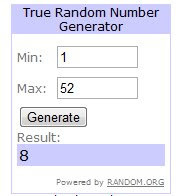 If there is no way to contact the winner after they are picked, a new winner will be selected. For extra entries, you many do any or all of the following. Each requires a separate post in the comments. * Blog about this giveaway (1 entry), with link back to this page. Leave a comment to this post with the URL of your blog post. * Tweet about this giveaway, with a link back to this page. Leave the URL of your tweet in comments. This entry is available daily (up to 7 entries; leave a comment for each individual tweet). Contest ends February 10, 2012 at 12:00 noon Pacific time, with a winner selected by a random number generator and announced shortly thereafter. Entries must be in English. Entries containing URL links not connected to this giveaway will be considered spam and deleted. We're putting together a few different giveaways together right now, details are still being worked out, but when the fun is ready to start, we'll let you know!